So, who was John Steed? Steed was a professional agent, a dapper dandy, a charming, flirtatious man about town. A gentleman in a bowler hat, eccentric, enigmatic and as dangerous as he was good-humoured. A man who professed to abhor violence, but who was quite capable of it. A well-bred, well-educated Englishman who remained, at heart, the "avenger" of the title. A fascinating chameleon who adapted perfectly to changing circumstances. 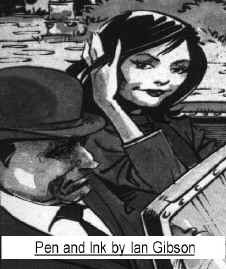 The origin of the character John Steed? Part Scarlet Pimpernel, part Macnee's aristocratic father, and part Major Charles Hammond (Ralph Richardson) of British intelligence from the 1939 movie "Q Planes" or "Clouds Over Europe". But all Patrick Macnee! Special thanks to Susana, Mona, and others for their contributions. In the B&W Emma series, an address was listed as '4 Queen Anne's Court'. An impressive double fronted corner Mews house with excellent natural light to three sides. Featuring a magnificent 30' x 20' First Floor Reception area and own Garage. Comprising over 2,000 sqft (188sqm). Strongly recommended. In The New Avengers, he had a Georgian Mansion, called Steed's Stud. Cricket Honors in 1957 (mentioned in Dead Men are Dangerous). No parents or siblings are mentioned by name. But he had one sibling. Mentions a nephew that he's always buying toys for, who never receive the toy. Always mentions an auntie (something or other) for an amusing or tragic anecdote. Mentioned a niece in the tag scene in Love All. Registered wine merchant: "Steed, Steed, Steed, Steed, Steed, and Jack"
Collector of charitable contributions for some obscure or non-existent organization. Early Suits from Thrift Brothers, designed by Pierre Cardin (65 guineas). Later Suits from Bailey and Weatherill of Bond Street, designed by Pierre Cardin. Shirts are South sea silk from Seville Row (10 guineas). Silk ties (Double Windsor knots). Shoes (short boots) from St. James. Bowlers from Hemming’s and Paul in St. James (10 guineas) Later by Arthur Benson. Brolly from Bolton and Sons (bamboo handle, perfectly balanced, handle slightly weighted). Cufflinks and tie pins are Caveshon Crystal or diamond. Edwardian style of suits: Braided pinstripe suits, elegantly embroidered waistcoats, cummerbunds, drainpipe trousers, and curly bowlers. White or blue silk shirt. Light blue gray (or black) bowler and brolly. Ties: Royal blue w/white spots. Gold w/Diamond tie tack. Royal blue silk tie w/Diamond tie tack. Royal blue silk tie w/navy blue spots. Light blue gray (or navy blue pinstripe) (or dark gray) overcoat. Light blue gray leather gloves. 2) Black double breasted suit. Black silk tie, bowler, and brolly. Diamond tie tack. 3) Navy blue (w or w/o pinstripes) double breasted suit. Navy blue silk tie, bowler, and brolly. Ties: Navy blue w/Diamond tie tack. Maroon w/diamond tie tack. Light gray. Gold (or white w/stripes) silk shirt. Dark brown or gold silk tie. Dark brown bowler and brolly. White or Gold silk shirt. Dark brown, bowler, and brolly. Ties: Dark brown w/gold tie clip. Medium brown silk tie, bowler, and brolly. Tan bowler (dark brown band) and brolly. 8) Charcoal gray pinstripe suit. Light gray tie. Black bowler and brolly. Black or cranberry silk tie. Black bowler and brolly. 10) Light gray w/dark pinstripe suit. 1) Riding suit w/high boots. 2) Black turtleneck sweater w/medium gray slacks. 4) Black or Navy blue smoking jacket. 5) Medium gray Edwardian jacket w/tall medium gray bowler and brolly. Light gray slacks. White knit gloves. White ascot with thin dark stripe checks or white ascot w/gold and diamond pin. 7) Fluffy shirts in the tag scenes from the Tara series. 8) Kilt from Castle De'Ath. Robert Hillingford's "The Charge of the Light Brigade"
Layouts of Steed's flat, '3 Stable Mews', after piecing together the sketches - and doing a little guessing. Click on the thumbnails to see the enlarged photos. These layouts will be redesigned and replaced as we get more details. There is a ceiling view from Death's Door! 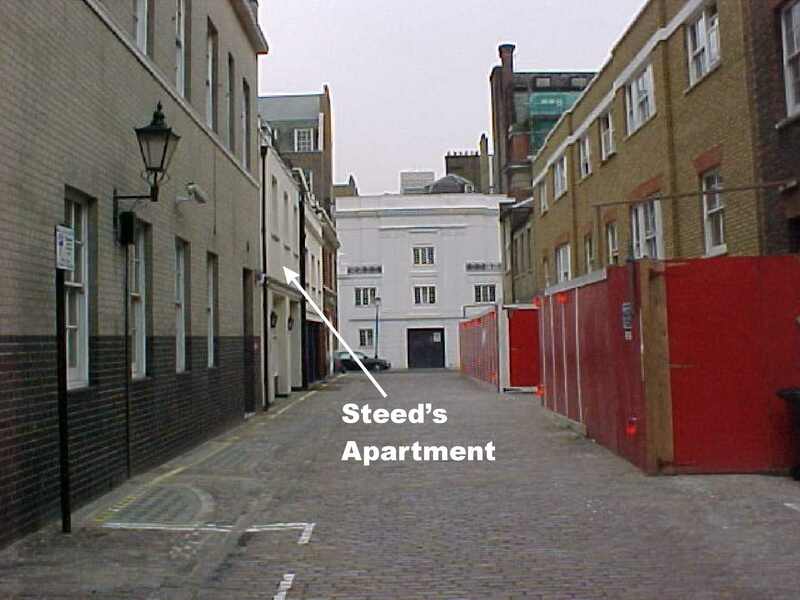 Photos of the front of Steed's apartment. The walls are light oak and the ceiling wood trim is dark brown. There is no known ceiling, because of shots from above. If a ceiling would be shown, it is probably white. The room is filled with replicas of cannons, infantry and cavalry soldiers, and replica weaponry. Most likely all from the Napoleonic Era. 8 x 10 pictures of infantry soldiers are found on many walls. The rug in the middle of the room is yellow or light brown. The wood floor is navy blue. The cushioned chairs are red leather, matching the red Chesterfield. 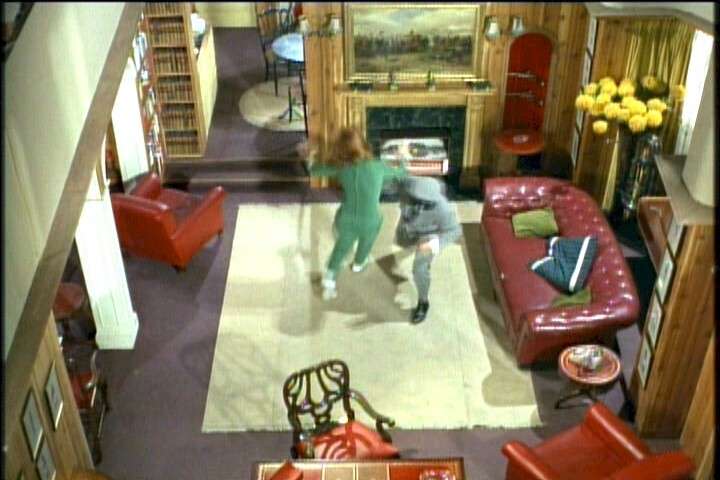 The placement of the furniture constantly changes in various episodes. The wood furniture is either mahogany or cherry. I replaced the original sketch, with this one showing the main window (overlooking the road) on the bottom. 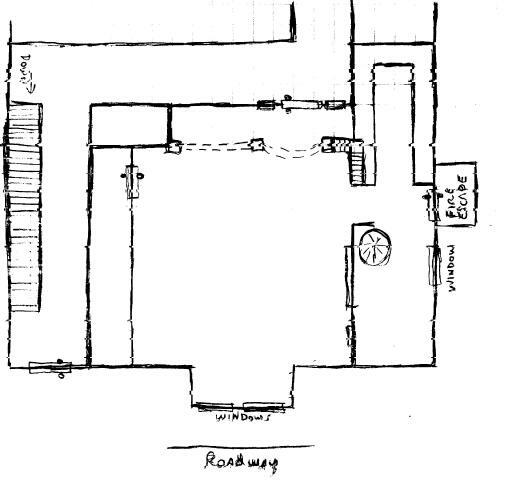 The Swiss doors are on the right side of the sketch with a possible fire escape. The main door is at the top, leading into the hallway. The stairway leads down toward the building's front door. So, to leave the front of the building, you would exit left from the main door of Steed's room, and left down the stairs. I would guess that there is another flight of stairs to reach the upper floor (the same place that the spiral staircase goes to). I do a lot of guessing about the kitchen (top right), the area behind the fireplace (bottom right), and the area behind the main camera views (center left). Also, where does the spiral staircase goes to? It would seem that it leads to Steed's bedroom and bathroom, and probably more. The placement of the flat within the building are based upon three known items. 1) The room is on the second floor because of the view from the window (center bottom) down to the road, and in 'The Forget-Me-Knot' Tara and Emma pass each other on the stairs (left side) to Steed's room. 2) The window with the tuba overlooks the main road. 3) The back Swiss door (middle right) leads outside. So, it is on the right side of the building. There must be a fire escape or outside stairs from the second floor. 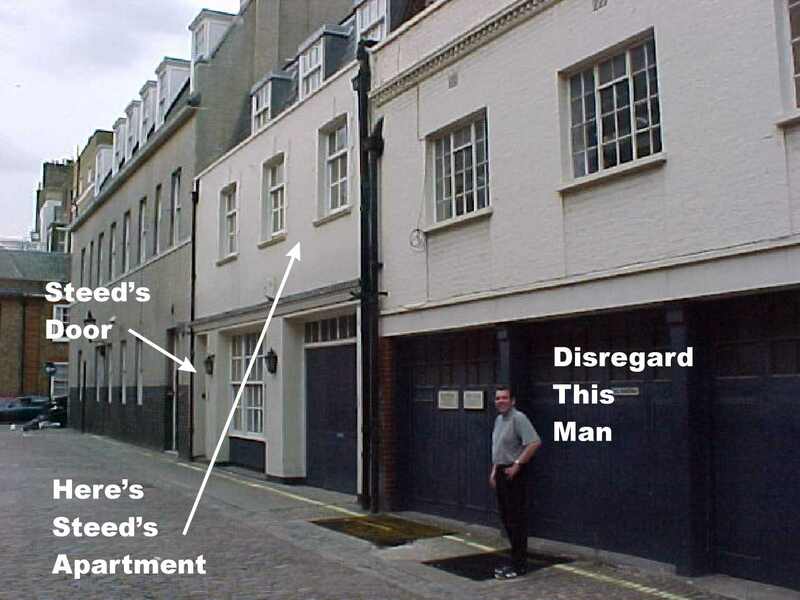 I have been told that the actual building (on Duchess Mews) doesn't have a fire escape, so where does the door go to? 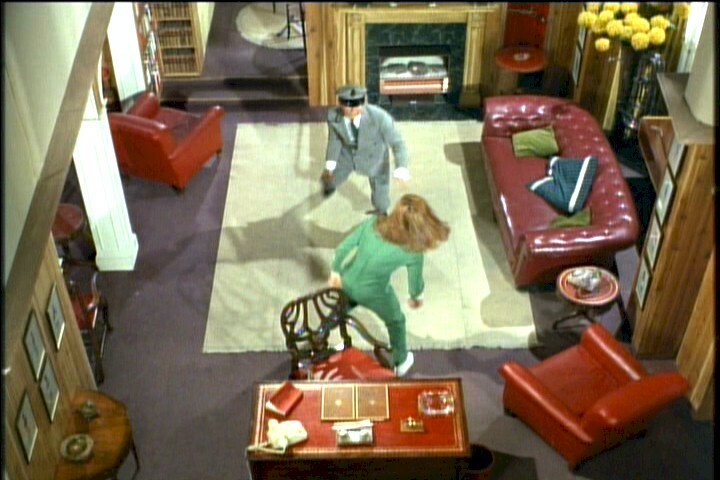 But because two sides are outside walls, then Steed's flat has to be the far right end of the building. Nothing Sherlockian, just deductions from putting it to paper. Yes, I know that many comparisons have been made before and the layout of the building and the layout of the flat have some discrepancies. It would seem that set changes occurred to match storylines and sometimes conflicts with other observations. So, I have tried to design a layout that is consistent most of the time. The following are very rough sketches of the walls in Steed's flat. I tended to fill in some gaps based upon remembering snippets of scenes and blending in similar bits of decorations. I am going through all the color episodes again to see if I am overlooking anything. If I did, I will make corrections as needed. Sketch of the fireplace wall (on the right side of the main sketch). On the left of the fireplace, are the bookcases and entryway to the kitchen and spiral staircase. The fireplace has a chest or cushioned foot-rest stored in it. The lights on both sides above the fireplace have crossed arrows. 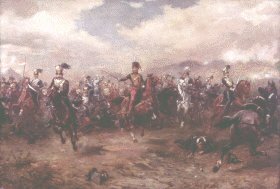 Above the fireplace is Robert Hillingford's "The Charge of the Light Brigade". There is a display on the right of replica dueling pistols with a red background. Below it is a small end table. Sketch of the opposite wall (from the typical camera angle). We know that there is a closet on the right side of the wall (where bodies were piled and sports equipment were stored in 'Who's Who???') and a work desk sometimes appears there. I am guessing that there is another room on the left side (possibly even a bathroom). Sketch of the wall behind the fireplace wall. The kitchen is on the left and the Swiss door leads outside. The phone sits on the kitchen counter that has a brick base. The right side is the wall behind the spiral staircase. Possibly the area behind the spiral staircase is a dining room. Sketch of the red main door with light blue side glass plates. There is a secret unlocking device on the outside of the door, above the door trim. On the left is a mahogany or cherry chest of drawers. Above it is a shotgun and rifle rack. On the right is a red chair in a small red nook. The lower part of the sketch is the inner wall/entryway. On the left is a small end table and on the right is a bookcase. The trim in the archway is painted white. Sketch of the window that overlooks the main road. The three window curtains are olive green. In the center is a small folding table and chair. On the left side of the table is the tuba filled with yellow carnations. 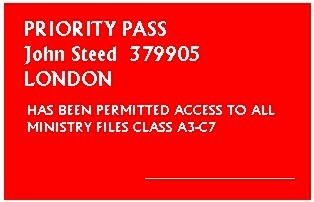 If you have more information about Steed's flat, please contact me and I will update the information. I’m following my father’s footsteps. He spent his life depositing money, I spend my life withdrawing it. He who talks too much, forgets his listener. A hunted animal always returns to it’s lair. I’ll wait for it there. When the enemy thinks you are beaten, that is the time to strike. Wherever I linger, I leave my mark. Just remember, money isn’t everything. You know my Claret doesn’t travel. It’s important to do these things well. Gentlemen? We’re few and far between. I’m very bad tempered until I’ve had my first glass of champagne. Awkward phase or not, I don’t approve of it. Ask Mrs. Peel, I haven’t killed anyone all week. But a little cheating is expected. (Steed is a genius at cribbing). Fight to the death? I most certainly hope 'not'. When in disguise and found out: It's that casual air of elegance that always betrays me.